2014! New year – New Recipe! No, it’s not the Chicago Thin Crust recipe. I’m still working on that. Follow RealDeepDish on Facebook to check out the progress and join in on the fun. 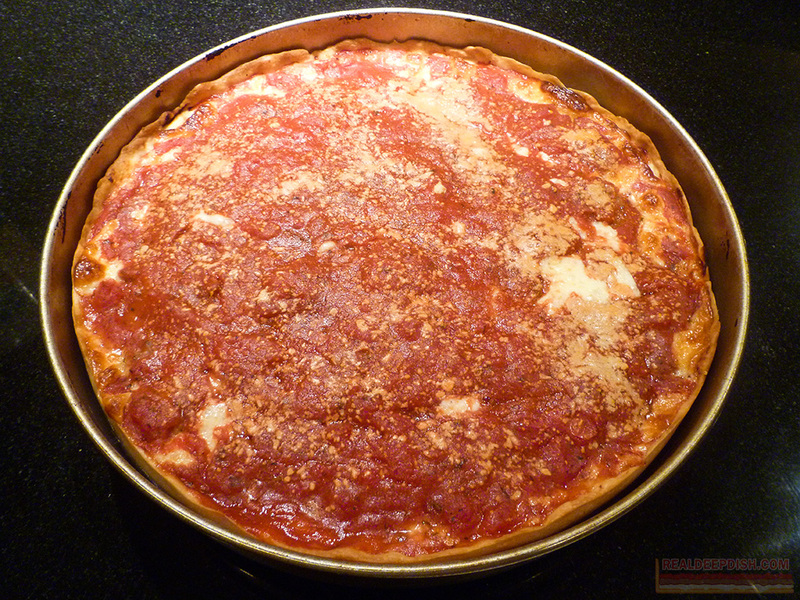 I have updated the main recipe for Deep Dish Pizza. 1) My crusts were turning out really thin (not always a bad thing), so I was a bit concerned about stability, and I thought you could benefit with a little bit more dough to work with. 2) I wanted to make the dough less stiff and closer to the soft puffy cloud, memory-foam-mattress-like texture that you see when Marc Malnati presses out his dough on TV. Overall, I wanted to give you all a better dough that was easier to use. While I was at it, I did a slight revision on the instructions as well. because it is not hard to do (especially with the new recipe), and it shouldn’t take you very long. Use 3/4 lb (3 links) of Italian Sausage for a 12″ pizza. Place dabs of sausage down on top of the cheese so they are just touching, until you have a “web” of sausage covering your whole pie. This is better than pressing out a large patty, and you will reduce the possibility of your sausage shrinking into an island in the middle of your pizza. It’s also easier to do this with food service gloves. Go easy on the sauce. For a 12″ deep dish, use 14 to 16 oz (by volume) of crushed tomatoes (drained, if your brand of tomatoes is on the watery side). Cover the whole pie, all the way to the inside edge. No, not that kind. Put a sheet of heavy duty aluminum foil over the top rack of your oven to keep the top burners from burning your pizza before it’s done. 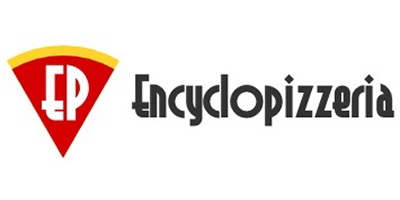 Check out the “Pizzafication” page for more info. 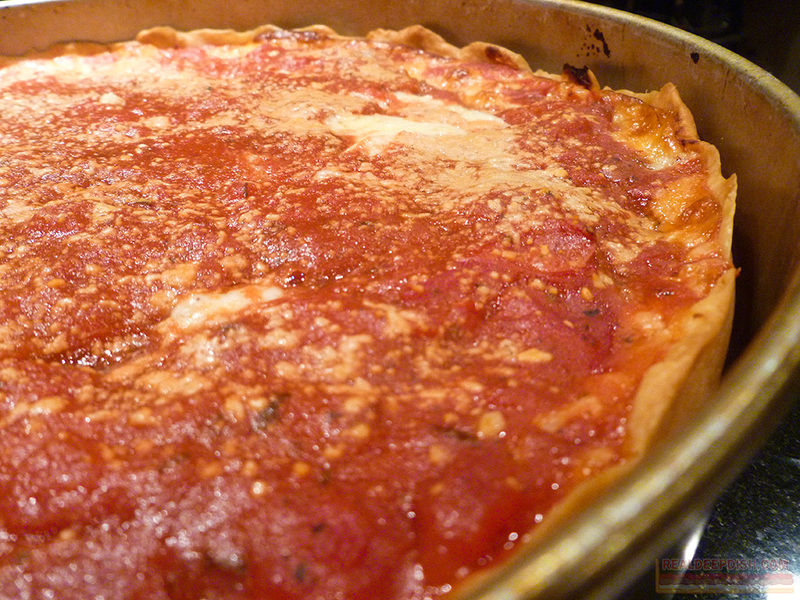 A 12″ deep dish should take 35-40 minutes in a preheated 450-460 degree oven. 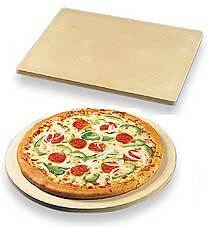 Smaller pizzas will bake faster. A 9 or 10 inch pie will take 25 to 30 minutes. You just took your pizza out of the oven. I know it’s tempting but don’t cut into it. Not yet. Give it 5-10 minutes to settle. Your pizza is still technically cooking. The moisture needs to get reabsorbed by the sausage and there’s still steam coming off of those tomatoes. Cut into it too soon and you’re going to have a puddle of liquid in your pan. If you still have puddles forming, it’s not the end of the world. Click here for a video tip on grease control. 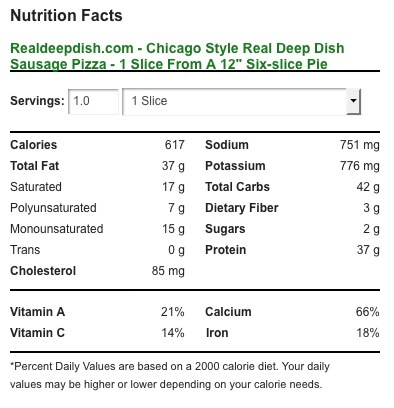 One slice of deep dish sausage pizza is about 620 calories. That’s if you’re cutting a 12″ deep dish into 6 slices. If you cut a 12″ deep dish into 8 slices, each slice is about 465 calories. You can now get the nutritional breakdown of a Real Deep Dish recipe slice of cheese or sausage deep dish pizza (both 1/6 and 1/8 portion sizes from a 12 inch pie) at MyFitnessPal.com . On that site, you can track your calorie intake, watch your sodium and potassium levels, and set fitness and weight goals. 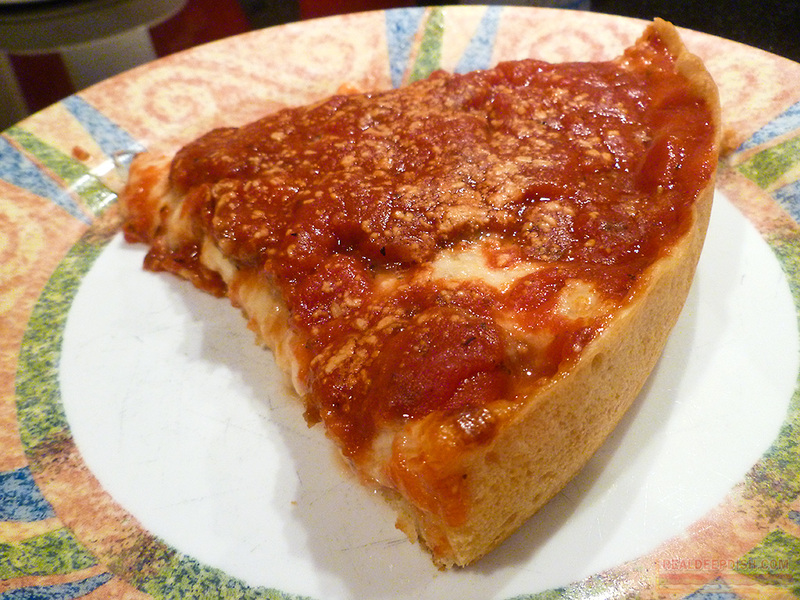 YOUR GOAL is to be as healthy as possible so every once in a while, you can eat a slice of Deep Dish Chicago Heaven without having a coronary. ‹ The Truth Will Set You Free. So just regular old all purpose flour… huh??? Also I am limited in tomato selection in South Texas… Del Monte, some store H-E-B brand… I found Muir Glen at Wal Mart but they were fire roasted. Any Tomato suggestions??? Hi, Joe. 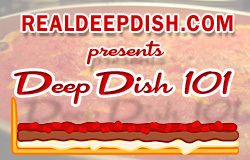 Thanks for visiting RealDeepDish.com! AP flour, YES! I like Ceresota/Heckers, but any AP flour will do. Pick the best canned tomatoes you can. I like crushed tomatoes for consistency, but you can use whole or diced if you can’t find crushed. It will just take a little more effort to drain or hand-smash if necessary. As for the brands, use tomatoes that taste best right out of the can. I like the “Muir Glen Crushed with Basil”, but you can use any store brand. Taste the tomatoes right out of the can and decide if you need to add sugar or salt. Take a little time and check out the other articles on the website. There’s are tips and tricks all over the place. Good luck with your pizza! After trying and searching many blogg recipes to copy the dough/crust on Lou’s/Uno’s/Due’s/Gino’s Chicago Style Deep Dish pizzas, this is by far the best recipe for the Malnati dough. Living in a suburb of Chicago, down the street from a Lou’s restaurant and having 2 friends who work at the restaurant, I know there are only 5 to 6 main ingredients…..and corn meal is not one of them. Flour, water, yeast, salt and Corn oil/olive oil. I was told that corn oil is the main oil and olive oil is used sparingly. They also use a bit of corn oil in the pan bottom only. As this recipe states DO NOT oil the sides of the pan. The flour comes premixed, dry in bags and they add the water, yeast, corn oil/olive to make the dough daily. This is a great recipe – I would love to post photos if there is aplace on this site to do that. Here are my comments on the recipe and instructions. I made enough dough for a 14 inch per the instructions – but then split it and weighed it out for the 10 oz size. ( exactly 359 grms). That left me with about 330 grams for pizza 2. From watching Marc Malnati demonstrate making his families famous on many YouTube videos ( especially helpful was the one with Christopher Kimball from America’s Test kitchen ) – BTW the ATK recipe of them trying to copy the crust is horrible/not even close. From watching that episode you can see what tomatoes they use – they are not crushed they are whole/plum in puree and he smashes them as he put pushes them on the pizza. You can also count the number of slices of whole milk mozzarella slices he puts down in a number of videos. In terms of the sausage – they use pork, sausage meat only seasoned with salt, pepper and garlic. NO FENNEL( I was able to go to my local Italian grocer in the area and buy sausage with salt and pepper only and a small amount of garlic Italian sausage to mix in the salt and pepper meat. From the videos you can also understand the technique for putting the sausage on the pizza ( it is not thick and it is pushed into the cheese to flatten it out, not really dense but like a web. Lastly – they use Romano Cheese not Parmesan and you can hear Marc state oregano and other spices are mixed in or sprinkled on at the end. This dough recipe is the keeper !As close as I’ve tasted. Well done ! Hi, Anthony. Thanks for visiting RealDeepDish.com. I’ve covered a lot of the things you’ve mentioned in a number of articles on this site. I’m glad to hear the recipe worked for you. and I can re-post them to the page wall when I see it. I’ll send you the photos – I also have a Cooking FB page – Passport to My Kitchen – I am planning on posting photos there also. I would like to post your recipe or link to your site ( giving credit to you ) if you are OK with that. I totally enjoyed my first attempt at a Chicago DDP using your 2014 updated recipe. It’s amazing the detail and care you’ve put into making a recipe that’s easy to follow and comes as close as I’ve tasted to authentic Chicago style. 1) My dough didn’t rise — at all. I used a brand-new packet of active dry yeast, well within marked expiration date. I used the exact amount recommended for a 14″ crust. I controlled the temperature for the yeast to 110 degrees, though I noted that it’s hard to KEEP that temperature for long: once it goes into a bowl its temperature plummets. All I can think is that perhaps I over-kneaded: By the time I got enough flour into the yeast, oil and water mixture to form a thick batter, I was already up to a couple minutes. Our house was cold (70 degrees), so I left the dough ball in a closed oven I had BRIEFLY warmed to perhaps 80 degrees. 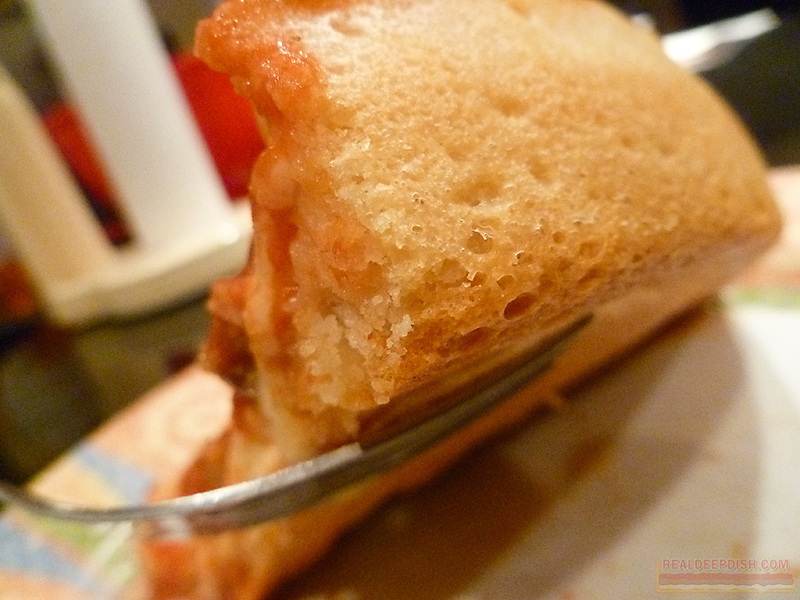 The final result was a pretty thin, pretty dense crust. Tasty, to be sure, but I’m guessing not as good as it would’ve been had the dough risen. 2) I found it difficult to get the dough to stick to the sides of my deep dish pizza pan — it kept sliding down (I did NOT oil the side of the pan). 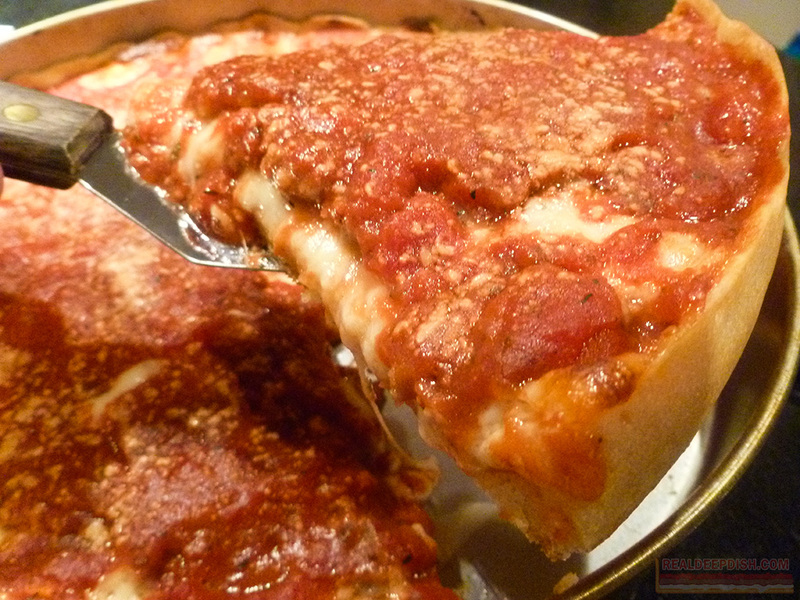 3) Even a 24 oz can (drained) of Muir Glen Crushed tomatoes barely covered the pizza. It ultimately took TWO 24 oz cans (drained). 4) I found that even with your 2014 recipe, I was stretched thin for a 14″ pizza. I’m going to retry using a 15% increase for all the dough ingredients. 5) What would be the effect of using a high gluten bread flour (e.g. Gold Metal bread flour) instead of the usual all-purpose flour? 6) You mention Semolina as an option, but for us newbs, what would be the effect on the taste of the dough? 7) What about mushrooms? 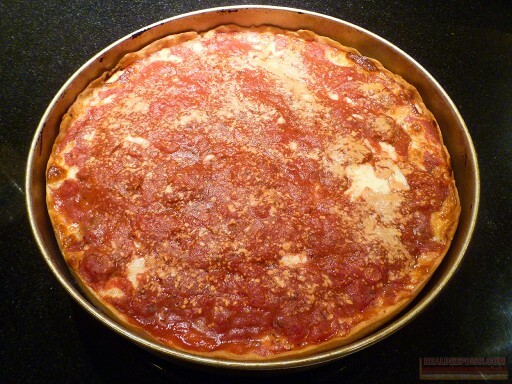 Is that not an authentic deep dish topping? Hi, Stephen. Thanks for trying out the recipe. If you’re expecting dough similar to Neapolitan or New York style, it won’t be like that, but I understand how deep dish dough can sometimes be a little too dense if you don’t get a proper rise out of it. Most major yeast brands are pretty resilient, so I’m not sure why yours didn’t work. I use red star active dry, and also have good results with “rapid rise” (and great results with instant yeast if you can find it). I’ve also had good luck with fleishman’s yeast. Your water temp should be fine between 100 and 110 F. Throw a bit of sugar in there to wake up the yeast. How long did you let your dough rise? If 2 hours didn’t give your dough enough rise, go for 3 hours, or punch down the dough after the first 2 hours and give it a second 2 hour rise. Or let it do a slow rise overnight in a zip-top bag in the fridge. As for mixing and kneading times, those are just estimates. You’re probably fine there. If you’re using Muir Glen crushed tomatoes, you don’t really need to drain them. That could be why you had to use 2 cans to cover a 14 inch pie. I usually make 12 inch pies, so the recipe will be most accurate for that size, and I use about 16 oz (by volume – aka 2 cups) of crushed tomatoes on a 12 inch. If your dough won’t stay up on the sides while you’re pressing it out, you might want to cut back on the oil just a bit, either in your dough, or anywhere else along the recipe that you may be adding it. High gluten flour will make your dough tougher. I’d stick with all-purpose. Semolina is wheat, so the flavor should pretty much be the same, but possibly more pasta-like. It will make your dough more yellow. I’m not a huge fan of ‘shrooms, but it’s perfectly fine to put them on a deep dish. Some mushroom lovers I know think they’re great on deep dish. You might want to put them in under the sauce, or wait until the pizza is baked half way before adding them, because they do contain water, and will lose a lot of it if you put them on top of the pizza at the beginning of your bake. My dough recipe may be on the thinner side of deep dish dough recipes, so that 15% increase might help you out. If you don’t want to do all those conversions, you could also get away with just increasing your flour and water and leaving the rest of the ingredient amounts as-is. Does this crust have the buttery flavor like a Lou Malnati’s pie? If not, how can I replicate that? Everyone’s tastebuds are a little different, so it’s hard to say whether you’ll pick up the “buttery” notes of this crust or not. 3) brush more melted butter around the outer crust edge after baking. Alternately, you can try substituting some of the oil in the dough recipe with melted butter, but realize that melted butter also contains water, so you may want to reduce your water by a tablespoon or two. Thanks for the reply…was wondering if you’d ever thought about doing a sponge and possibly, in addition, not kneeding and letting the dough rise in the fridge for 24hrs? I’ve done that “artisan bread in 5 minutes” no-knead, cold rise for bread, and it makes some pretty tasty baguettes, but I’ve not used it for pizza. I’m sure you could, but I’m not really going for non-chicago styles of pizza dough on this site. I encourage everyone to try different methods and go with what works for you. Do you think there will be too much gluten formation with an over-night, no-knead cold rise in the fridge? Kneading causes gluten formation, so if you’re not kneading, then I’m gonna lean toward “NO”. Evidentially once flour is wet these enzymes called protease start eating the glutenin(protein) and gliadin (sister protein) and by eating them the glutenin denature from curled up little balls to hydrophilic long strands which want to bond with other glutenin strands forming gluten. All the white the gliadin proteins get eaten by the protease as well but they form into hydrophobic ball bearings that knock up against the glutenin strands knocking them apart continually which you would think would be counterproductive for gluten development but somehow breaking them apart actually makes the net grow ever bigger a lot like kneading. why did you eliminate the Olive Oil??? Personal preference. Use any oil combination you like, but be aware that some kinds of oil have lower smoke points than others.